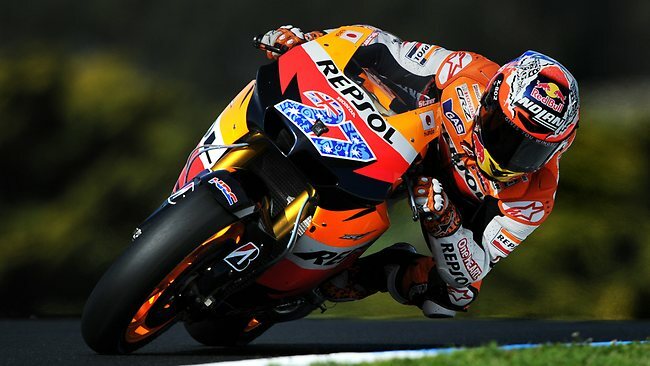 Patra's Other Place: Congratulations Casey Stoner!!! You probably all know about Casey Stoner's win already, but Ken and I are so chuffed!! Ken rode down to the Island on Sunday with one of his mates David. It was a cold wet day, but they wouldn't have missed it for the world, seeing our Top Aussie motorcycle racing ace Casey win the grand prix on home ground, win the world championship, and celebrate his 26th birthday! Picture from "The Australian" newspaper. Here is Ken ready to take off at 8 am on Sunday morning on his Suzuki. David on his Harley Davidson. Never heard of Casey Stoner, but glad you're pleased! Hi Gina ~~ The boys look great in their gear and I bet they loved seeing Casey Stoner win on his birthday. I am glad you and Ken spent time watching and listening to the birds in your aviary. I hope Ken is listening to the naturopath and startimg to drink water I always have a jug of water in the fridge as it tastes better when it is cold. Esp. as the weather gets warmer. Ken must be feeling pretty good to be able to handle the bike trip and to see your Aussie boy win. Say hi to him and hope he keeps getting stronger every day.